I needed a hostess gift the other day as we were invited to an Un-Halloween Party for those of us who do not celebrate Halloween; just a fun get together at someone’s home in the boonies where no trick or treaters visit. (We do not celebrate for religious reasons. )I decided to make a cute petal top box. It isn’t so small, it measures 4x4x4” which means it can hold quite a bit. It is easy to make, just follow the directions for Petal Top Box at Clearly iStamp. I made a couple changes, in the directions, the lower half of the petals are on top of any designer paper and mats on the sides, I didn’t want to cover all of my embossing so I tucked the circles underneath. Actually, I didn’t have much of the paper I used for the petals (and I hate to waste anything!) so I only cut partial circles. After all, I’d already decided to tuck them under my side panels so why not use only part of the circles? I used a half circle plus 1/2” to tuck in. You can see in the following picture the before and after shapes of my petals as I trimmed them slightly to make them look neat under the side panels. It is hard to see but there is a white metal snowflake brad holding the bow on the box. 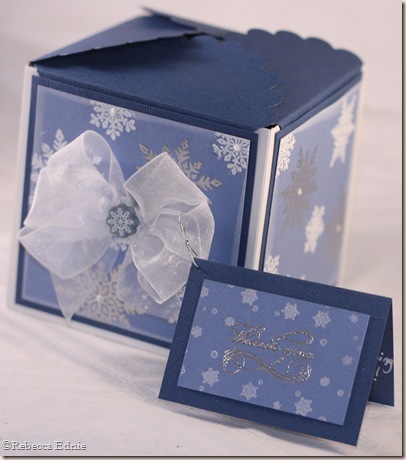 It has a blue plastic embellishment glued to it, the dots in the middle of the snowflakes are Frosted Lace Stickles. The card is meant to be removed at some point. I know, it is hard to read the silver embossing-note to self: silver embossing is hard to read on anything but really dark paper!! It says “thank you”. The hostess loved it! 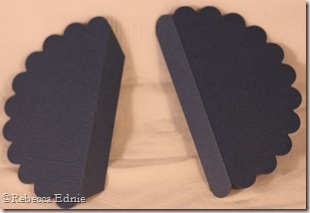 Paper: dark blue CS-stash, medium blue, white-SU! This is really pretty, Rebecca, and I love the size of it! That could really hold alot of stuff in there! Sounds like you had a nice evening. Hope all is well!